Dr. C.P Parameswaran Nair, a well renowned ayurveda skin specialist and an ‘Arya Vaidyan’, is indeed gifted with the divine power of healing scars and skin diseases. He got the curative formula of “Agnijith” when he was 9 years old from his uncle who had found the secret from an old Sanyasin. After long years of research and studies, he developed the medicine that can cure all kinds of skin problems and severe burns caused by acids, explosives, chemicals etc. Dr. Nair practiced Ayurvedic Medicine in the traditional Gurukula system, under Dr. K.S. Warrior, who was former chief physician to the President of India. Under the guidance of Dr. K.S. Warriorr, Dr. Parameswaran Nair undertook the research on burn studies a long forgotten area in the Ayurvedic medicine. After 12 years of Ayurvedic study, he took his Diploma in Ayurvedic Medicine from Madras. At first he used the medicine for a three-year-old girl who came to Dr. Warrior with deep burns. The girl had accidentally fallen into the vessel where gruel was been cooked. The local physician tried their best to treat the child but all known treatments were failed before her. It was then Dr. Nair asked his teacher if he could do treatment that his uncle had taught him. With Dr. K.S. Warrior’s permission, Dr. Nair started the treatment and the child was completely healed. Thereafter, the Ottamooli (single medicine therapy) however it is severe or old, every case that came to Dr. Parameswaran Nair, was found to be effective. It has found that the medicine has no side effects and its miraculous ability to refurbish skin into the earlier vitality had won world wide recognition to Dr. Nair and Padanjali Ayurvedics. Even scars that couldn’t be removed with plastic surgery were effectively healed by Dr. C.P. Parameswaran Nair’s skin treatment. Later in December 1995 he found Padanjali Ayurvedics at Kuttipuram in the Malappuram District of Kerala. For this he owes a lot to the Njanapeedam award winner Mr. M.T. Vasudevan Nair, who is an active patron of Dr. Nair’s treatment. The name of Nair, his wonder medicine – ‘Agnijith’ and the institution ‘Padanjali’ are getting to be known even outside Kerala. Patients from all over the world now-a-days contact Dr. Nair to start alternative treatment for their diverse skin problems. Dr. Nair was once asked how a good drawing teacher came to be an Ayurvedic physician. The answer was that he had studied Sanskrit and loved it while studying art in Kozhikode. 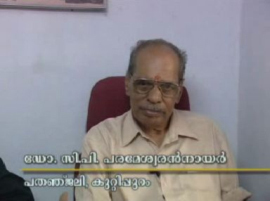 Due to his interest in Malayalam literature he became close to N.V. Krishna Warrier, N.N. 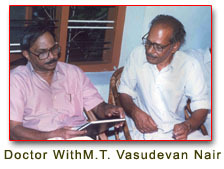 Kakkad and M T Vasudevan Nair. Krishna Warrier would always advise Dr. Parameswaran Nair to study astrology or Ayurvedam and he decided to do so. N.V. and Kakkad took him to Dr. K.S. Warrier under whom he started his Ayurveda studies. At first the classes were in the Calicut branch of the pharmacy. Swami Prakashanand also helped him. After 12 years of study, he took his diploma from Madras. However he got appointed as an Art teacher in Kumaranellore High school. Later, he took voluntary retirement and devoted all his time to medicine and research. Dr. Nair has translated the Valmiki Ramayanam in verse form. This was published in the Kesari weekly magazine.